The freedom and overall control a writer enjoys when self-publishing isn’t limited to novels, memoirs, or poetry collections. If you’ve written and illustrated your own comic book, self-publishing can work for you too—if you know the right steps. Self-Publishing Relief breaks down what you should consider as you ka-pow! and gadzooks! 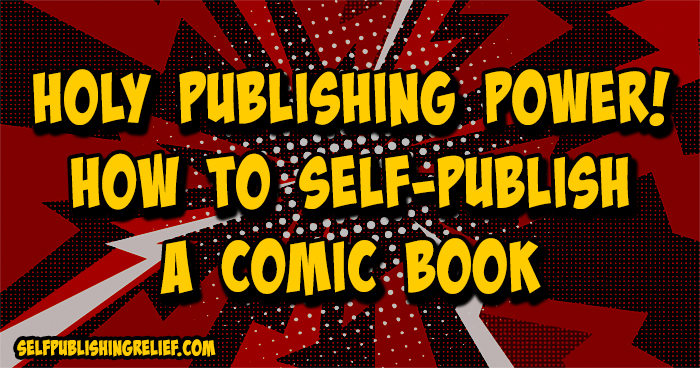 your way through the process of self-publishing your comic book. Determine how you plan to tell your story. It’s important to know your goals when creating a comic book. Is your story one that can be told comfortably in a single issue? Or do you have an ongoing story arc planned that you can tell over six issues that could later be collected together in one volume? How long will readers have to wait for the next issue from you? Sweat the small stuff. You may be creating a comic book or graphic novel rather than a book filled with only words, but that doesn’t mean you should neglect the standard proofreading tasks. Whether your manuscript is a single 22-page issue or a graphic novel spanning 120 pages, be sure you’ve proofed every page for errors in the artwork and typos in the lettering of the various word balloons and captions. You want your comic book to deliver the very best quality experience for your readers. Decide on format. Is your heart set on holding a print version of your comic book in your hands? Do you want to publish your comic as a webcomic, releasing it to the world a page at a time? Are you envisioning your comic book as a digital release? Will you sell using online retailers or only through your website? The answers to these questions will guide you when beginning the self-publishing process. You can choose to release your comic book in print and digital formats through Comixology, a popular platform that accepts submissions from comics creators, or Webtoon, which lets comics creators publish for free on their platform, with the option to monetize their work and more. Ka-Blam, Print Ninja, and Lulu will also print comics on demand. Print Ninja offers to mail you a sample kit of paper textures, page size examples, and other information to help you decide if their service is right for you. Gumroad and Sellfy allow users to set up digital storefronts to sell their content. If you write and illustrate your comic books, you could sell a PDF sketchbook of your artwork alongside the digital copy of your comic book. Crowdfunding. Acclaimed writers Jimmy Palmiotti and Gail Simone have used crowdfunding platforms like Kickstarter to cover the cost of creating their comics. Successful crowdfunding requires careful planning to ensure that the final product will be delivered to backers. And if your supporters like what you’ve created, they’ll be more likely to invest in your future comic books if you seek their support again. Gather Patrons. Subscription services like Patreon could be another way for you to deliver comic book content to your readers. Patreon allows users to pay creators a fee in return for content each month, whether it’s new pages from your comic book, short comic book stories, or a combination of the two. Patreon also lets users in on your process, and is a great way to share different types of content from your comic book. You can share process videos showcasing the creation of your comic art, special sketches and concept art, pages from the script of your comic book, or a combination of these elements. Once you’ve self-published your comic book, it’s time to don your self-promotion superhero cape! Spread the word on social media and see if there are any venues where you can promote your work. And start thinking about the next adventure for your hero or heroine! Question: Do you have an idea for a comic book that you’d like to self-publish?